*Disclaimer: The following post is just me relating my personal experiences and my son’s particular health situation. I am in no way promoting any health advice. Please consult your health professional concerning your own health needs. Nearly two years ago, my son began having frequent bouts of anaphylaxis. We had to take him to the ER several times in a month. We had absolutely no idea what was causing his severe allergic reactions, but suspected some food was the culprit. I brought him to an allergist as soon as possible. 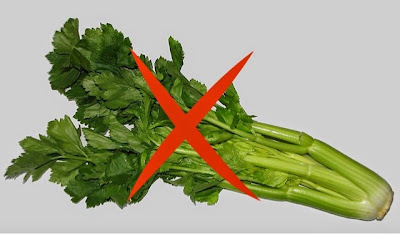 Many tests later, the allergist diagnosed my son with a severe form of Oral Allergy Syndrome called Celery Spice Syndrome. Although the condition seemed to come on suddenly, it had been building over the years, and my son just did not realize that the less severe reactions he was having weren’t normal. The list of foods he was allergic to grew very long and includes: wheat, celery, parsley, cilantro, citrus, apples, pears, cherries, nuts, peanuts, cumin, curry, lettuce… And the list goes on and on. As a gardener, it was natural for me to begin researching out which plant families his major allergies were related to. Through my research, I discovered that some of his allergies were linked to a whole plant family, some were genus specific and some are limited to a species. I was determined to find foods he might be able to try that were outside those plant groups. One fabulous thing I have learned along the way is that the world is full of all sorts of varieties of foods that we never eat in a typical American diet. After careful study, consideration and consultation with my son’s allergist, I felt ready to try some different greens, fruits and vegetables that he might be able to safely eat. I sourced seeds and plant starts for these plants, and grew tester seedlings one by one. We slowly, carefully began to have my son try a tiny bit of each new food to see if he would react. A few times we were unpleasantly surprised when he did react to a food I was not expecting. Then we would step back, research again, and begin our trials again. I am happy to report that we have found many foods my son CAN eat. Happy, happy, happy. 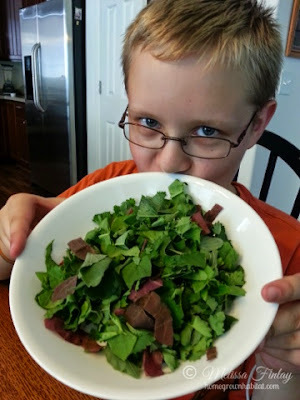 Just a few weeks ago, our garden was finally producing enough greens for my son to have a full salad. Imagine this teenage boy so excited to eat a SALAD for dinner! Sometimes life throws us a curveball that, while difficult to get through, helps us to appreciate the simple and small pleasures in life. This is a partial list of some of the foods we have tried; some have been successful cooked, some raw, either way, I am so glad to have an expanded variety of foods to feed my son. Way to be an awesome mom who would go to all that effort to find healthy garden fresh food for her son despite his allergies 🙂 Good job, mom! That is awesome! I am the adult that has OAS and have never put in the time and effort to keep trying things to see if they react or not. You are an amazing mom.